I've just come inside after spending a couple of hours this evening in the garden. Rather than being tired from it all, like I thought I would be, I'm all pepped up and excited about this new growing season. Either way, I'm off to a good start in the veg garden this year. This evening, I planted out onion sets. I plant them close together so I can get some good green onions in just a few weeks by thinning them out. Then I leave some to grow on so I can harvest a few large onions later in the season. Earlier in the week, on Sunday, I sowed seeds for six varieties of lettuce, three varieties of radishes, spinach and Swiss chard. I've left that raised bed uncovered for now but before those seedlings pop up, I'll cover it with a white garden cloth to keep the rabbits from eating everything. While I was out in the veg garden, I checked on the peas I planted on March 17th, but didn't see any seedlings coming up. I'm sure they'll come up in a few days, especially if it rains like the weather forecasters predicted -- three days of rain heading our way. I have one more crop to plant in early spring -- potatoes -- and then I can turn my attention to other areas of the garden while I wait for the last frost, which is usually around May 10th here. I have plenty to do in the meantime. I'm preparing a bed next to the garage for blueberries. I need to add amendments to bring the pH down from our normal 7.0 to 5.0 or 5.5. The more acidic the better the blueberries like it. But before I amend the soil, I need to remove some non-descript shrubs - three beautyberries and two hydrangeas. They aren't bad shrubs but they aren't all that exciting, either. I'd rather try to grow blueberries. And while I was ordering the blueberry plants, I ordered some thornless blackberries. I'm going to plant them along the fence in the veg garden. I already have raspberries, red and gold, plus honeyberries, grapes, and three kinds of apples. And I'm thinking about trying to grow some pawpaw trees. I don't spray any of it. I am happy with whatever fruit I get using organic methods. I tell people all the time not to bother with pesticides in their home gardens. After all, we can all buy plenty of pesticide-laden fruits and vegetables at the grocery store. 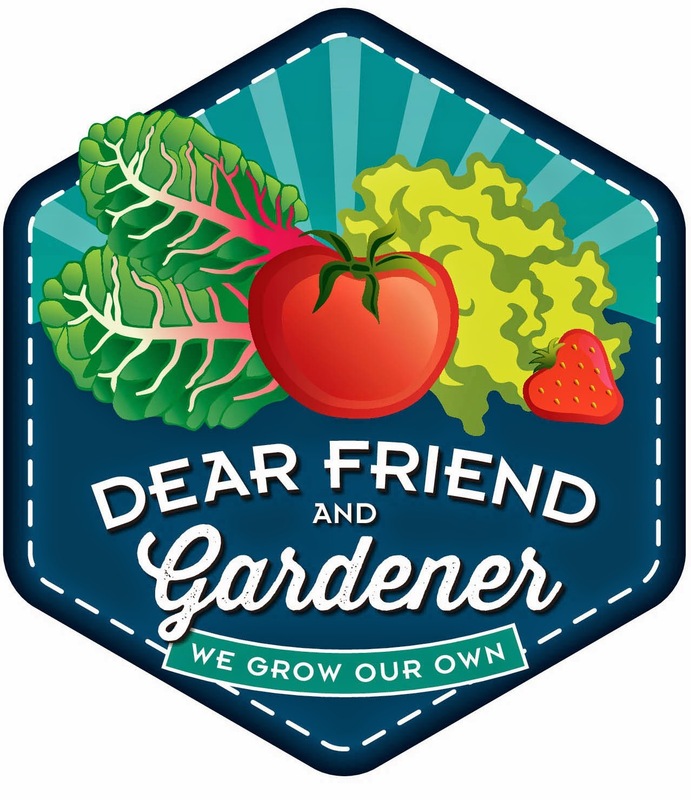 I think I'm rambling a bit now, so I'll close with a hearty thank you for including me in Dear Friend and Gardener, a virtual gardening club for everyone. P.S. Would you like to join our virtual garden club? If you grow your own food and have a garden blog (or start a garden blog), we would love to have you join in. Just go to the home page for Dear Friend and Gardener, grab the badge, put it on your blog with a link back to the club page. Then post about your veg garden about once a month during the growing season. We want to hear all about your growing adventures. Let Dee know you've joined, and she'll include a link to your blog on the club page. That's it! I hope the rain that's here and coming will help my lettuce and Swiss chard to sprout!